After a pancreatic cancer diagnosis, a healthcare team, including doctors from different specialties, nurses, and case workers, will create an individualized treatment plan based on many factors, including the patient’s age, overall health, and cancer stage. After the patient’s cancer stage has been determined, there are several treatment options that may be considered. These treatments may be used separately or in combination. Although treatments provide benefits, there are also side effects that you should be aware of. 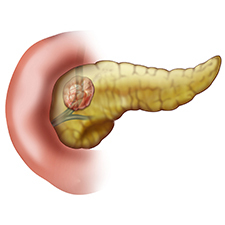 Depending on a patient’s pancreatic cancer stage, the patient and his or her healthcare team will discuss goals for treatment and care. The patient’s goals can range from achieving full recovery, to extending life expectancy, to creating a palliative care plan. Then, after taking into consideration other health conditions, the healthcare team then recommends a tailored treatment plan based on the patient’s individual diagnosis and goals. It is important for patients to discuss with their healthcare team all available treatment options, and to consider getting a second opinion before beginning treatment. (Note that some insurance providers require a second opinion before proceeding.) Patients should also feel comfortable to seek out a different healthcare team that may be a better fit for them. Get information about survival rates in pancreatic cancer.